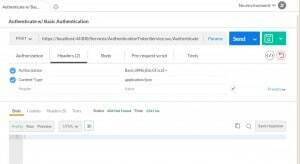 In Authentication Token Service for WCF Services (Part 3 – Token Validation in IDispatchMessageInspector) we showed how to verify our token against a database. The token is a great tool. The authentication service also provides the token based on a post of credentials. In this article, we are going to add support for Basic Authentication. We aren’t going to do it the standard WCF way, using Transport security. We will keep our security at none, expect the deployment to be https and roll our own code to handle Basic Authentication. There are two features we want in order claim support Basic Authentication. Allow AuthenticationTokenService.svc to create the token by optionally using Basic Authentication. Allow Basic Authentication as an option to providing a token. To provide these two features, first we have to understand Basic Authentication. Basic Authentication is a well-known standard that is defined. The first part of the Authorization header value is just the word “Basic” followed by a space. The second part is the username and password concatenated together with a semicolon separator and then Base64 encoded. Let’s start with a simple class to manage the Basic authentication header, and encoding and decoding it. BasicAuth.cs has constructors that allow for encoding by passing in a username and password and encoding it, as well as constructors that allow for passing in the header value and decoding it to get the username and password. If we add BasicAuth.cs to our existing WcfSimpleTokenExample project, we can easily use it to support Basic Authentication. By using the BasicAuth.cs class, we can provide support for Basic Authentication in our token service using only 3 lines of code. 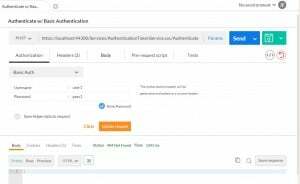 Below is our new AuthenticationTokenService.svc.cs. Lines 18-20 our the new lines we add. In our TokenValidationInspector.cs file, we are already validating the token using DatabaseTokenValidator, Now we need to validate the crendentials. We can validate credentials using the DatabaseCrendentialsValidator object that is already being used by AuthenticationTokenBuilder. However, we have to add some conditionaly code to test if a token is provided or if Basic Authorization is provided. If both are ignored, the token takes priority. To do this, I wrapped the existing lines calling DatabaseTokenValidator into a method called ValidateToken. THen I created a new method called ValidateBasicAuthentication, which we only attempt to call a token isn’t provided. There are not changes needed for the web.config. Here is a copy of it though, for reference. You could create the Authorization header yourself, but PostMan will create it for you if you click the Authorization and select Basic Auth. Enter your username and password and click update. All this does it create an Authorization header for you. You can see this by clicking on the Headers tab in PostMan. Go ahead and click Send and you will get your authentication.